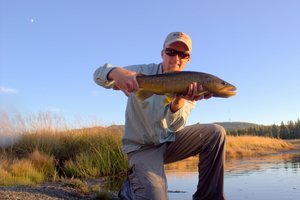 One of my favorite ways of fishing is to hike in on a day trip, sometimes up to 15-16 miles roundtrip. Sunday's goal was not that optimistic. I'm out of shape after a lazy winter so 10 miles roundtrip seemed reasonable. The trailhead at Elkmont was reasonably busy when I arrived at 10:00 a.m. Sunday morning. An hour later, I was 4 miles deep in the backcountry and ready to start fishing. The stream temperature was about 48 degrees and the clouds hinted that the air temp might not climb much as the day progressed. A double nymph rig seemed reasonable considering the conditions and I tied on a GRHE with a softhackle dropper and a couple small split shot. After a couple fruitless casts, an energetic rainbow hit the Hares Ear and the day progressed nicely in similar fashion. An hour later I had caught 10 fish and was getting hungry. During lunch I began noticing that every time the sun poked through the clouds bugs would start flying up from the stream. After I started fishing it began to make sense. The rocks were all covered with newly hatched yellow stoneflies. It was too cold to fly quickly so they were waiting for the warmth of the sun to take to the air. 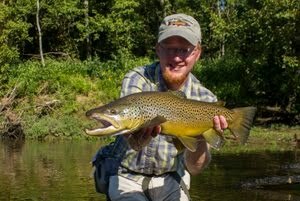 This revelation brought out my trusty Tellico nymph as the new dropper and the catching continued. 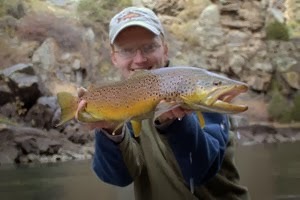 Not long after lunch I hooked and lost the best fish of the day, a brown pushing 11 inches. I missed a nice brookie as well but the rainbows kept coming to hand at a steady pace. 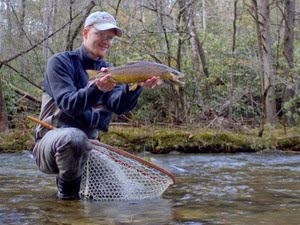 In prior years I visited the Smokies a couple weeks from now, and that yellow stone dry has always been my best fly. I've fished up above Elkmont several times, though the farthest up the Little River I've gone was about a mile past that small footbridge across the river. That was a pretty sunset Sunday; we saw it from the parking lot of Steak N' Shake in Athens (it's a ritual - we always stop there on the way home). However, the fact that we were seeing the sunset there meant that we didn't get home until almost 5 in the morning. I was a zombie at work yesterday. 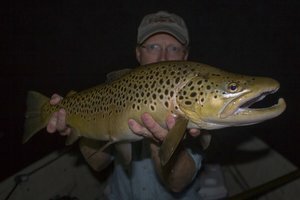 I saw a pretty good hatch on Straight Fork on Saturday, but nothing rose to them. It was a different story Sunday on Cosby - we did very well...about 40 between my oldest and myself. I wasn't planning on fishing Cosby this trip - I hate to rely on it like a crutch, but after a near-skunk on Saturday, we wanted some action. Heard y'all were in Cataloochee over the weekend, too...I like that area, even if it is a pain to get to. Yeah...my oldest actually outfished me, but I beat her in quality fish ;)...You're probably right about the 'bows in Cataloochee, and I wouldn't be surprised if the brookies take advantage of it. Last summer, I caught a nice spec on Palmer, and not very far up the trail either...I was surprised. There were a lot of nice bows in that stretch, too...and if they're out of the picture, the brookies will have less competition. From what your partner posted over on LRO, I know exactly which road you were on...and, that is a scary place to break down - miles from anywhere. Wow, you have skills. The pics you take of skys and landscapes are awesome. Great site!